Eyelet curtains are a great choice for a contemporary home. Simple and stylish, eyelet curtains are simple to install and look great, too. If you’re wondering how to hang eyelet curtains, then you’re in the right place. 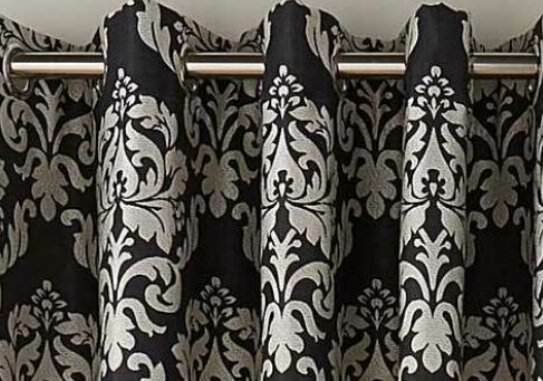 Hallam Damask Lined Eyelet Curtains in Charcoal. Get them here. Before you do anything else, you need to buy a curtain pole that fits your window comfortably. Ideally where space permits, allow an overhang either side of the window. To hang eyelet curtains correctly you need to leave a little bit of space on either side of the pole. If you don’t, the rings will catch when you pull the curtain to. Ensure the diameter of the pole will fit your eyelets on securely. It’s time to measure up. Your curtain pole should be approximately 130% of the width of the window. This will allow the maximum amount of light to enter your home when the curtain is open. You will need your brackets to be entirely level. Check this is the case by taking several measurements and marking the lines in pencil before drilling. Alternatively, you might cut a right-angle into a piece of cardboard and place it against the top corners of the window. Flip it, and you’ll ensure that the distances are even on both sides. We recommend using a spirit level. As a general rules, the rail should sit several inches above the window and several inches to either side. You can create the illusion that the window is wider or taller than it really is by adding a few inches in either direction – provided you have the space to do so. It’s time to drill the holes you’ve marked. You should be able to do so while avoiding wires, but do be sure to check there isn’t a socket immediately beneath you, invest in a stud finder – they’re not expensive, and well worth the investment. Next, you’ll need to install wall anchors or raw plugs into the holes you’ve just drilled. If your pole is particularly heavy duty, this will help secure the screws. You can now screw the brackets into position using a screwdriver. If you were careful when marking up, the two brackets should be parallel and capable of supporting the weight of your rail and curtain. It’s time to thread the eyelets onto the rail. Remove the finials (those are the bits at the end of the rail that keep the curtain from falling off). Next, thread the eyelets through, ensuring they’re the correct way round, place end nearest the wall. It’s often easiest to fold the curtain first and then thread it through in one go. When you’ve placed both the curtains onto the rod, you can hang the rod on the brackets. You have two options when it comes to hanging the curtain. You can conceal the bracket behind the outer two eyelets. A "pleat" will cover the bracket. You can have the entire curtain panel sitting on the inside of the bracket. Option one tends to be more aesthetically pleasing, and it will prevent the curtain from moving too far across the window. Your curtains will also need to be slightly wider than in option two. If (as suggested) you’ve been generous with your curtain dimensions, this shouldn’t be a problem. So you’ve successfully hung your curtains, but you’re not done yet - there’s one more thing to think about – tie backs. Tie backs aren’t usually needed on eyelet curtains, since they naturally stay in position when drawn. You might still choose to use them however, simply because you like the way they look. For best results, install around a third of the way from the bottom of the sill, and ensure that each tie back is installed at the same height. Hanging curtains in bay windows complicates things a little. In this case, rather than threading the curtain across a single window, you’re threading one across three or more windows. This means you’ll have to alter how you measure up. It also means you’ll need a special type of flexible curtain pole that can be affixed to the top of the window or ceiling. Another, simpler option is to hang a single long pole across the front of the bay, and treat the windows inside with thinner dressing that hangs from the top of the window. This means you won’t need a curved pole, and you can get away with hanging shorter curtains.